KANSAS CITY, Mo. — Leaders of the Kansas City Police Department are still taken aback by the loss of one of their own. A KCPD officer died Monday, days after suffering a self-inflicted gunshot wound in the parking lot of a Liberty church. KCPD and Liberty police found the officer, a 10-year veteran of the department, on Friday night. In the midst of business at Tuesday's Board of Police Commissioners meeting, there were moments of reflection. "When we have situations like this it's sometimes unbelievable how well we come together to support the family," KCPD Chief Rick Smith told the board. "Yesterday we spent some time with them, and there was nothing but praise for our support for their family from this family." Department leaders are also reminding the rank and file to look out for one another. Sgt. 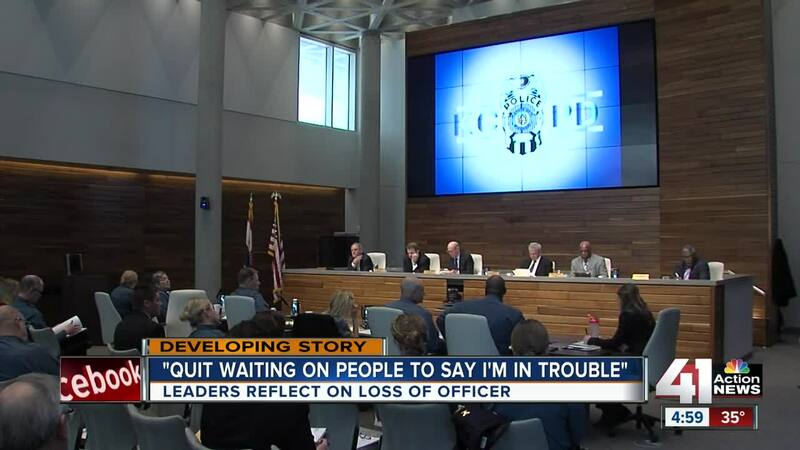 Brad Lemon, president of the KC Fraternal Order of Police Lodge 99, said that on Saturday morning, he put out a call "that said if you're in crisis, you need to call me." "About 8 o'clock I woke up and just started thinking that I'm not getting phone calls. I never have, we very seldom do," Lemon said. "So I just picked up the phone and started going to through every single police officer that I've (represented) in a shooting in the last three years, and I started one by one calling people and asking them how they're doing." The recent tragedy also brought up the demands officers face and possible solutions to address them. "From a budgetary standpoint, how do we get there? I don't know what the magic number is," Councilwoman Alissia Canady, chair of KCMO's Neighborhoods and Public Safety Committee, said. "I imagine they would like to have another 100 additional officers, but whatever that number there is not a clear path in our budget process to support that, so the resolution really for a conversation where both sides of the street will begin to define what that process looks like." Others said that it's time to start taking a more proactive approach to these issues. "There are common denominators here for people who find themselves in these spots of despair and hopelessness that we know," Board of Police Commissioners President Nathan Garrett said. "We know that doesn't mean that everyone will end up there, but we know the common denominator and it's probably time to start looking at those and look at policing inward instead of just outwardly." "I think that's maybe the key of what we have to do is quit waiting on people to say that I'm in trouble and just understanding that they may be," Lemon said. A relative of the officer said the family has decided not to release his name. The relative thanked KCPD for its ongoing support. Anyone considering suicide is encouraged to go to a hospital, call 911 or the National Suicide Prevention Lifelineat 1-800-273-8255. Police can text “BLUE” or “TALK” to 741-741 to reach the Crisis Text Line.